I can't think of many things that bore me more than the sport of baseball. I hopped on the Brewer bandwagon after they started doing so well this season not because I started to like the sport, oh no. I did it because I like to tailgate and I generally enjoy anything that gives me an excuse to take off work to drink beers at noon. With that being said, I wasn't sure I'd like The Art of Fielding. I got it for my birthday back in September but didn't pick it up until recently because I thought like the sport itself, this book would bore me. Man, was I wrong. This was one of the best and one of the most captivating books I have read all year. 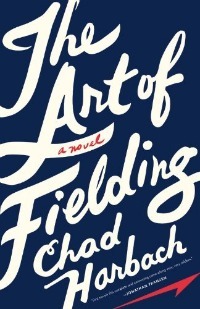 The Art of Fielding follows a baseball team at a small liberal arts college in Wisconsin. Specifically we get to know Henry, the most promising player on the team, Schwartz, the team captain, Owen, Henry's eccentric roommate and teammate, Affenlight, the president of the school and his daughter Pella, who just returned to the Midwest after a short, failed marriage. These five central characters struggle to maintain happiness and find their way among the pressures and anxieties they are faced with. At its heart, this book is about relationships. It examines the relationships we have with others and more significantly, the relationship we have with ourselves. It's about new starts and new love, and learning to find your place among others. Each of us, deep down, believes that the whole world issues from his own precious body, like images projected from a tiny slide onto an earth-sized screen. And then, deeper down, each of us knows he’s wrong. It's hard to believe this is Harbach's first novel, because it's exponentially better than 99% of the other debut novels that I've read. Both the place and the characters Harbach has created are so fully realized that I can't help but wonder what they might be up to now. All in all, I didn't want this book to end. However, I did have reservations near the end, for two reasons. (Don't worry, no specific spoilers.) One, everything was wrapped up a little two neatly for my taste and two, there was an instance that seemed incredibly unrealistic in an otherwise realistic narrative. However, the book as a whole was so incredible that I wouldn't let my tendency to be picky about endings stop you from reading this book.Whether you are a baseball fan or your'e not, if you're human you will enjoy this book. I love the review Brenna! I was hesitant when I first read the synopsis because I am not a fan of baseball either. But this book was definitely so much more than baseball! I was surprised this was a first novel too. Glad to hear you enjoyed it. Andrea, I'm glad you liked it too! I think a lot of women who aren't baseball fans are a little hesitant to pick it up. Though I did hear if you are a baseball fan it's pretty authentic. Well, would you believet it? I come from the other end of the spectrum. Love literature and baseball but never read a book on my favourite sport. Will have to get this one. And I'm so pleased that you chose Cat's Eye as one of your favourite reads this year because that's one of my favourite novels by Maggie Atwood. Read it back in uni. Ta muchly. I'm so intrigued by this review. I do actually enjoy baseball and played a little in college, so I'm always interested to see a complex story with Baseball as a backdrop. I'll be reading this as soon as I can! I'm curious about this one and actually have reserved the library's audio version. Actually, baseball is the ONLY sport that I enjoy watching, so this book has been on my wish list of several months. It's slowly moving up the reservation queue at the library (think I'm sixth in line now)...can hardly wait! Ooh I am more interested in reading this now. Because yeah, baseball, not so into it. But hurray! I'm looking forward to reading this one in 2012. OK, I think I'm willing to give this a shot. Cos I'm with you about the whole "baseball is boring" thing. However, Boyfriend loves baseball so I got him the book for Xmas. I'll have to borrow it when he's done with it. I have to confess I wasn't tempted by this book because of the title (and my associated sports boredom) put me off. Having read your review I'm a little more tempted to read it but not quite enough. I'm glad that you enjoyed it--it surprised me (I thought the baseball would bug me) and kept me reading. I agree that it is really a book about relationships, maybe that's what made me like it more than I thought I would. I loved this one too, but I also had a small reservation about one of the storylines. For a debut novel, it was extraordinary. I loved seeing a small Midwestern college so fully realized. I'll be curious what his second novel is about!